Culbertson was the county seat of Hitchcock County for twenty years, and this marks the site of the first courthouse, used 1886-1893. Founded as a trading post in July 1873 by W. Z. Taylor, it became the county seat when Hitchcock County was organized August 30, 1873. The county was named for U. S. Senator P. W. Hitchcock, and the town was named for Alexander Culbertson, noted fur trader of the Upper Missouri then living at Orleans. The community consisted of Taylor's store and J. E. Kleven's blacksmith shop and post office until 1875, when thousands of Texas cattle was brought into the four southwest Nebraska counties. Culbertson was the only town in the region, and the ranchers made it their headquarters, many serving as county officials. During the years of the "open range", the ranchers spent summers on the range, but moved to Culbertson in winter, taking advantage of the schools and social life. The railroad arrived in 1881, and thousands of homesteaders flocked into the county displacing the ranchers. During this period, Culbertson became a pioneer irrigation center. In 1893, the county seat was moved to Trenton, near the center of the county. 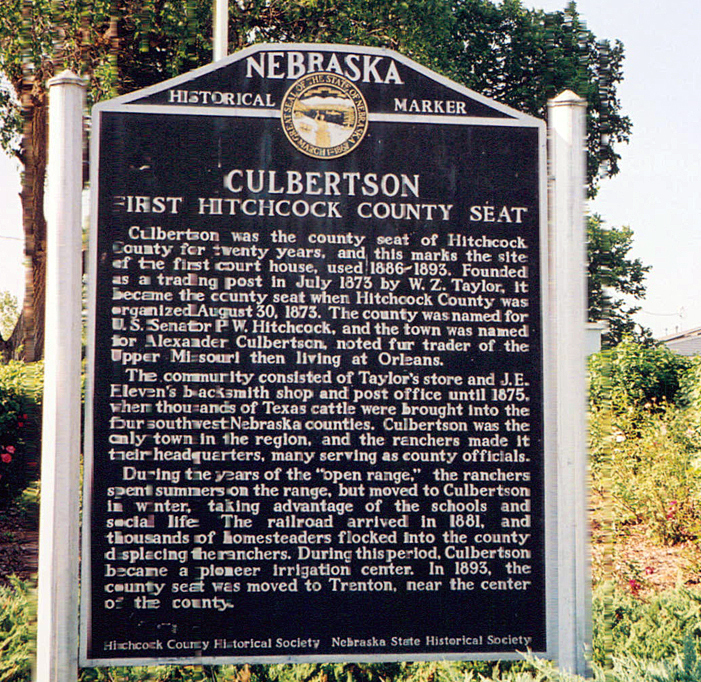 “Culbertson, First Hitchcock County Seat,” Explore Nebraska History, accessed April 18, 2019, https://mynehistory.com/items/show/274.